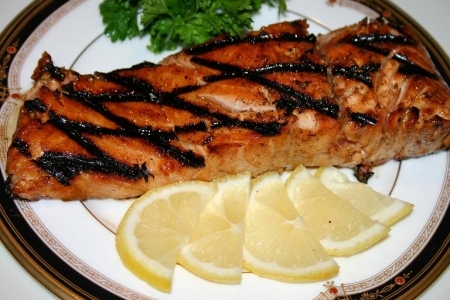 Salmon is a wonderful entrée that adults and kids alike love. The glaze is a hit because it takes on a sweet and salty taste. If your child doesn’t like the mustard, use just the honey for their serving. Serves 4. For marinade, whisk all ingredients together in a mixing bowl. Rinse salmon filets and pat dry. Pour marinade mixture into a flat dish and place salmon filets flesh side down into marinade, cover and refrigerate for at least one hour before grilling. Spray grill or grill pan with non-stick cooking spray. Burners for grill pan or grill should NOT be on when spraying grill. Preheat to medium high and place salmon filet skin side down. Cook for 5 minutes. Slide spatula in between the skin and the salmon. You should easily be able to separate the skin form the salmon this way, and flip. Discard skin. Cook for 2 minutes covered, and turn a ½ inch and continue to cook 3 more minutes to achieve the grill marks pictured. Remove from grill and garnish with lemon and parsley. Try Wente Vineyards Riva Ranch Chardonnay (Livermore Valley), Hahn Estates Chardonnay (Monterey), McManis Family Vineyards Chardonnay (River Junction, California), Flensburger Brauerei Gold Premium Lager Beer (Germany), Saint Arnold Weedwacker (Houston, TX) or a beer for Summer Flight by the Samuel Adam’s Brewery.